Vault of Light: Twilight Harbringer, finally! One of the great things about my new guild is their weekend achievement runs! Since I quit raiding during Cataclysm one of the things I've missed most is not the raiding itself but the atmosphere, comradely and friendship. The achievement runs my guild does during the weekend feels very much how raiding used to feel but without that little bit of added stress. The guild I used to raid with never took things too seriously during our raids and there was always a lot of banter between fights. 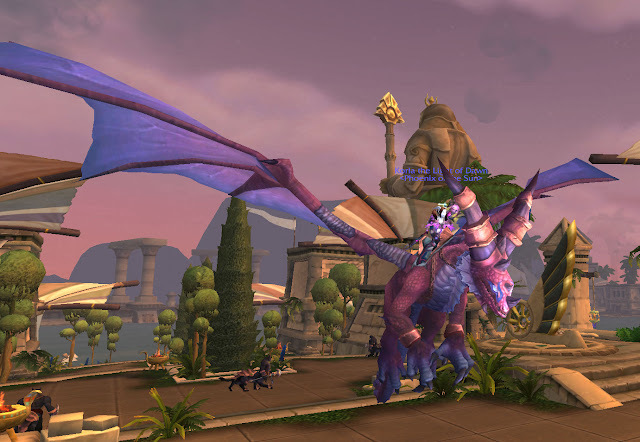 Last weekend I finally got something I'd wanted for a while but had never gotten around to doing since I stopped raiding right after we had cleared normal DS! I just didn't have the patience to continue raiding DS heroic as it was one of my least favorite raids. Reins of the Twilight Harbringer from the Glory of the Dragon Soul Raider achievement. The next post in the 20 Days of WoW blogging challenge asks "10 things we don't know about you" This ones got me stumped a little so I'll happily accept questions if you have any! Could make it a bit more interesting. Feel free to DM me on twitter if you don't feel comfortable leaving a comment. Are there any achievement mounts you've got your eye on? Just noticed I'm missing one achievement for my 25 man ICC achievement, that's a bit annoying! Gratz! Such a pretty mount! I know, I can't believe it's taken me so long to get! I could have done the runs ages ago with some friends or Real ID friends from Twitter but I'd totally forgotten how awesome it was! Thank you. WOW, I bet that was hard to get but it looks like it was definitely worth it. Thank you! Thankfully it wasn't too terrible. Did it in two nights. One night for most of the achievements then another night to do each of the bosses on heroic as that's part of the achievement. Gratz! That's an amazing mount - look at those horns! So badass isn't it? Thank you! Thank you ;[ I got them around the same time so it's been a lucky coincidence!